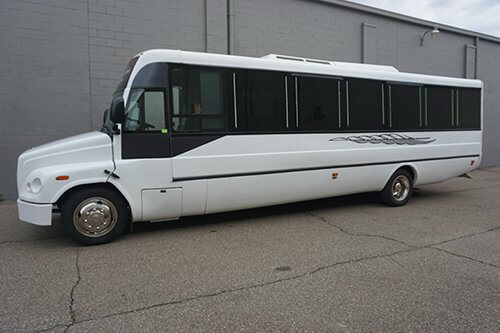 This is our largest party bus which holds 35 seated passengers. 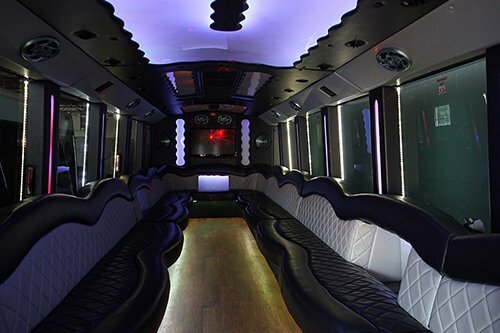 This bus has custom leather seating all the way around. There are flat screen TVs that are hooked up to one DVD player. You can bring any DVDs you would like to play while on the bus. Most people will bring a movie to watch but if you don't have anything and want to listen to music we have a fireplace or fish tank screen saver DVD to play in the background. 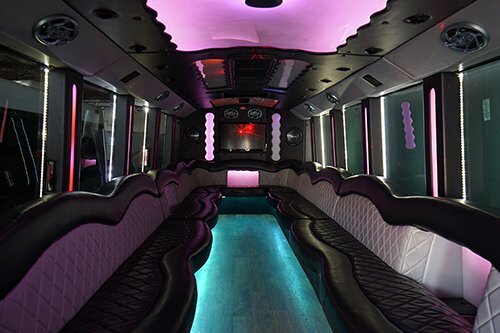 The bus has a dance stage equipped with a stripper pole. There are two granite bar tops with coolers built in as well as two extra coolers built into the seats. They will have ice in them and we also supply cups and paper towel. Through out the bus we have color changing lights that are hooked up to a custom light controller. There are different light shows for you to pick from and you can also control how bright the lights are. The bus has custom hardwood floors. For your music you would bring a CD or MP3 player unless you just wanted to listen to AM/FM. For an added audio boost, this bus has subwoofers.